[From the April 2014 newsletter] Last month’s newsletter raised a few eyebrows with the comment that there are only two DOCGs that produce rosato wines: Aglianico del Taburno and Castel del Monte Bombino Nero. Did we forget about Cerasuolo di Vittoria? In fact, despite the similarity in name with the rosato Cerasuolo d’Abruzzo, Cerasuolo di Vittoria DOCG is a denomination for red wine. Cerasuolo, a term meaning “cherry,” in the case of Vittoria refers to cherry aromas more than to the light cherry-red color of the Abruzzo wine. 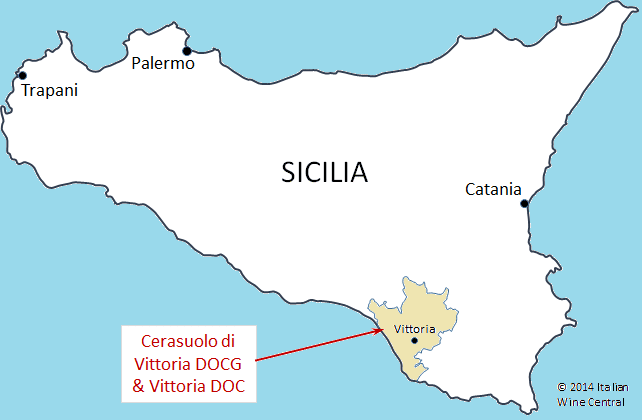 Cerasuolo di Vittoria is the sole DOCG of Sicilia, elevated from DOC in 2005. It produces only red wine, made from at least 50 percent Nero d’Avola and a minimum of 30 percent Frappato; no other grape varieties are allowed in the blend. The denomination is located on the south coast of the island of Sicily not far from the southeastern tip. It is collocated with the Vittoria DOC, which produces a similar red wine with looser standards as well as varietals of Nero d’Avola, Frappato, and white Ansonica (aka Inzolia). Within the Cerasuolo di Vittoria DOCG, there is a relatively large Classico zone, comprising the area originally included in the denomination when it was established in 1973. Vittoria itself is the largest town of the Classico zone. Wines from within this area can be labeled as Classico if they are aged a minimum of 18 months. Otherwise, wines can be released in the June after the harvest. The wines of the Cerasuolo di Vittoria DOCG are typically ruby red in color with aromas of cherry, red berries, plum, and pomegranate. The fresh young fruit character is typical of Frappato; blends that rely more heavily on Nero d’Avola show more tannin and hints of wild herbs. The acidity can be high for well-tended vines on the preferred terra rossa soil, and the minimum alcohol level is 13 percent. Production amounts to around 6,000 hectoliters, the equivalent of 50,000 cases (Vittoria DOC adds about 2,000 hl more).